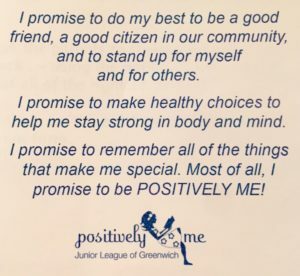 REGISTRATION WILL OPEN FOR THE 2019 SEASON OF POSITIVELYME! AT 8AM ON OCTOBER 1ST, TO REGISTER CLICK HERE. PositivelyMe! is a program for 3rd grade girls that helps girls develop the skills to be confident, to make good decisions, to be assertive, and to express themselves – all while meeting new friends and having lots of fun! Four, two-day sessions are offered and run Friday 5:30-8:30 pm and Saturday 10:00 am–3:00 pm. Attendees must attend Friday and Saturday. Girls participate in a variety of activities including song, dance, writing, crafts, and special projects. * The program is free to the community. * Each session will hold 36 girls. * Participants will receive a placement confirmation on or before December 20th. * Please direct all inquiries to positivelymejlg@gmail.com, including questions about being placed on a WAITING LIST.